Home MTAANI NEWS Leaders read sinister motive in Raila’s trip overseas ahead of polls. Leaders read sinister motive in Raila’s trip overseas ahead of polls. A section of Jubilee leaders are reading some mischief in NASA presidential candidate Raila Odinga’s trip to the United States of America and United Kingdom just days to repeat presidential election. The leaders see the move as a secret scheme by the opposition leader and some foreign countries to cause a political and constitutional crisis in a bid to force talks for a shared government. However, while talking at various stopovers during a prayer caravan in Thika Town, the leaders allayed fears of any crisis citing the Election Laws (Amendment) Bill, 2017, and the Election Offences (Amendment) Bill, 2017, that contain far-reaching changes to the existing laws as the sure remedy for Raila’s ‘dirty schemes’. “We know Raila has mischievously sneaked out of the country and may not return to participate in the election. Nonetheless, the amendments to the electoral laws that will be tabled in the House for debate and subsequent adoption starting Tuesday (tomorrow) will remove any grey areas in the current Act and will subsequently render null and void, Raila’s boycott threat,” said Thika Town MP Eng. Patrick Wainaina alias Wa Jungle. Wainaina also pointed out that the amendments made it a criminal offence with a jail term of up to five years for any presiding officer or returning officer knowingly refused to sign a required document, or to submit an incomplete document, or who willfully falsified an electoral document. “We know some of these foreign missions were involved in planning the regime change that rocked parts of Northern Africa and the Middle East during the infamous ‘Arab Springs’. Is it just by a coincidence that Raila is heading to Europe a few days to the elections, has refused to campaign and leading onslaught against the electoral process?” posed the Thika legislator. Kiambu Town MP Jude Njomo reminded the opposition and the foreign envoys that the sovereign power belonged to the people of Kenya and that power could never be assumed by any other body or elsewhere. “The voice of the people is the voice of God. I want to remind Raila and his foreign masters that the power to lead this country shall only be gotten from the people and that is through the ballot. Seeking it elsewhere is just living a mirage,” said Njomo. 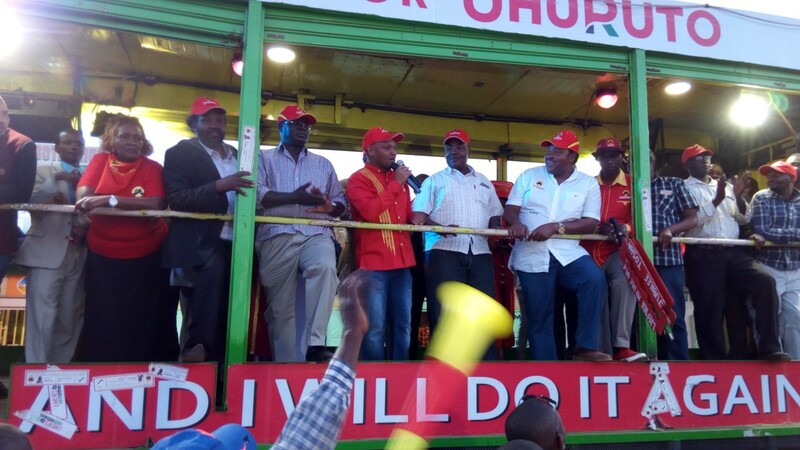 The leaders appealed to the people of Kiambu to get out in large numbers on the 26th of this month and vote for President Uhuru Kenyatta. They pledged to avail transport to facilitate all those who needed assistance to get to their polling stations in order to ensure that everyone voted. “We will avail transport to all those who cannot reach to their polling stations for one reason or another. We are also asking you to help us identify all those who did not vote in the August elections so that we do not miss out on any potential vote. This time we want Uhuru Kenyatta to win by more than 10 million votes,” said Ruiru MP Simon Ng’ang’a King’ara. The prayer caravan was organised by religious leaders from various denominations led by Rev. Bishop David Kariuki Ngari (Gakuyo) of Calvary Chosen Centre, Bishop Dr. Kenneth Mando of Christian Outreach Centre and Bishop Joseph Ng’ang’a Ndua who is a member of the Covenant of the Clergy. The bishops prayed for peace in the country during this time and also pledged their support for President Uhuru Kenyatta. Among those in the prayer entourage that crisscrossed three of the five Wards in the constituency included Kiambu Governor Ferdinand Waititu, his deputy Dr. James Nyoro and Kiambu Women Representative Gathoni Wa Muchomba. Others were MCAs Raphael Chege Waithumbi (Kamenu), Dunson Mburu (Hospital) and Andrew Ndirangu (Township), who joined the convoy at its last stop within the town’s CBD.